Welcome to Santa Claus Loves Christmas. This site is dedicated to Christmas and all of the things that make it so special. At the top of that list is the Birth of Christ, the true meaning of Christmas. Then of course there is Santa Claus and this site looks back at the history of Santa, how to write him a letter or even track his journey on Christmas Eve. Santa Claus Loves Christmas also highlights topics like Christmas trains, decorations, on-line Christmas shopping, Christmas videos, Christmas news, beautiful Christmas carols, poignant Christmas stories and many other interesting features. 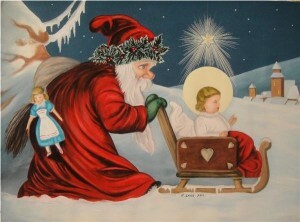 If you love Christmas then you will enjoy our Santa Claus Loves Christmas site. No Santa Claus! Thank God! he lives and lives forever. A thousand years from now, Virginia, nay 10 times 10,000 years from now, he will continue to make glad th e heart of childhood.